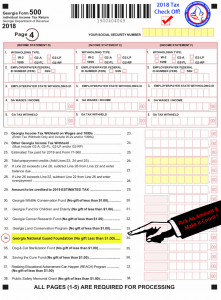 Georgia taxpayers have the opportunity to “pick an amount and make it count” for the GA National Guard Family Support Foundation, Inc. when filing State of Georgia Taxes for 2018! See attachment and LOOK FOR IT on Form 500 or Donations for Special Funds! Like it and share it on social media to help us get the word out! The Foundation is one of NINE charities approved by the Georgia Legislature in 2005 as a show of support for our organization and the Soldiers and Airmen of the Georgia National Guard! As a result of these contributionsand others, the Foundation has been able to approve $2.9 million dollars in assistance to over 3,342 members of the Georgia National Guard and their families. We need your help to do more! Thanks for your support!